Sold to Bob Hill who refined the deadwood. I then bought the tree from Bob. I did an initinal refinement of the foliage and a slight re-alignment of the front. At a workshop, Kevin Willson refined further. I was happy, but felt I there was a better tree awaiting discovery. I felt it needed to be split it up a little more. Pavel suggested I moved the whole trees branch structure closer to the trunk and tip it a little forwards, as it lent back too much. I raffied, taped and pulled it in with Pavel's help. I then re-styled the branches. Leaving the tree for Sundays workshop. Pavel being the hard worker he is, late Saturday night, sorted it out for me. Thank you Pavel. You are a real class act. The end result. Finally I feel the tree has reached it's potential. Excellent job. Really came a long way!! Give yourself a pat on the back from me and I'll drink a Guinness for you!! I'm getting it right now.....aahhhh......cheers....fantastic effort! Looks completely different. Pavel is amazing...he always get the best from any tree he touch! Very nice transformation.....can you provide the dates of the older photos? Also the last two photos - new pot angled to the camera, is that to show your next re-pot angle? Great tree! Really like the way you've gone with it. Funny thing is that as I scrolled through the photos first time round I was thinking "don't know about the first styling, I kind of liked it with the original cascading back branch". Then by the end of the process you've sort of taken it back to where it was originally (only much more refined). Like I say, great tree really like it (I've got larch envy - not for the first time ). gman wrote: Very nice transformation.....can you provide the dates of the older photos? Also the last two photos - new pot angled to the camera, is that to show your next re-pot angle? The first 2 pictures were not taken by me, so I am unsure. The rest range from September 2014 to march 2015. Yes the pot is angled forwards and next repot, I'll re- position it at that angle. Richard S wrote: Great tree! Really like the way you've gone with it. Next time Dragon have an event, why not attend. Lots and lots of fine larch availible here. We had Yorkshire, Dorset and Derbyshire represented this weekend + a load of welsh men and women. I was curious about one aspect of this progression: you seem to be progressively decreasing the visual distance between the live foliage mass and the dead wood on the trunk. Two questions: 1) when the tree flushes out, won't the foliage obscure that (truly) incredible deadwood work? And 2) do you feel this creates some visual confusion? It had been my impression that it was better to visually separate live and dead portions of the tree to decrease visual conflict and create an image that is more horticulturally consistant (viz. if one side of the tree has been so battered by the environment that this striking deadwood has been created, is it counter-intuitive to also find this delicate, picturesque foliage mass co-existing in the same space?). bottasegreta wrote: I was curious about one aspect of this progression: you seem to be progressively decreasing the visual distance between the live foliage mass and the dead wood on the trunk. Two questions: 1) when the tree flushes out, won't the foliage obscure that (truly) incredible deadwood work? And 2) do you feel this creates some visual confusion? It had been my impression that it was better to visually separate live and dead portions of the tree to decrease visual conflict and create an image that is more horticulturally consistant (viz. if one side of the tree has been so battered by the environment that this striking deadwood has been created, is it counter-intuitive to also find this delicate, picturesque foliage mass co-existing in the same space?). Yes, I expect there will be some re-balancing to do, once the foliage mass is present. I plan to keep the visual volume of the foliage in scale to the tree's image. Visually weighted to the whole. The tree clearly needed to have the foliage pulled in to create that balance and less conflict in the distance of the original separation. Again, I expect to have to adjust a little to create a visual balance. Dynamic conflict works for me. The "life struggle", depicted in this tree I hope. So just to clarify the point I was trying to raise: it has been my understanding that if we create a tree with features that are inconsistent with what we see in nature, our brain stops seeing a tree in nature and starts seeing a bonsai, and that's not what we want (assuming we are trying to capture the majesty of nature and transport the mind of the viewer to a natural environment while remaining safely and conveniently in our garden). With this tree, we seem to have a significant region of overlapping deadwood and live foliage mass, which is telling our brains simultaneously that that space is both hospitable and inhospitable to growth, which is subconsciously contradictory, breaks the suspension of disbelief and pulls our minds eye off that majestic snowy mountainside and back into the garden, or at the very least makes our subconscious mind second guess the apparent great age and resilience of tree that is evidence by the massive, weathered trunk. By, say, rotating the tree to the left, and maintaining the movement of the foliage mass to the right, can we counteract that, reinforce the feeling of age, and give the tree a more rested and stable feel (both in space and time)? Would keeping the foliage mass close to the deadwood without overlapping with it (significantly) draw our eye to, and highlight the deadwood (and the live/dead interplay) without breaking the illusion of a natural tree? That's just how I feel when I look at this tree. And I understand there isn't always a perfect solution, and the tree is frankly amazing as it is, I just figured a tree with this much potential might withstand a little nit picking and I could pick someone's brain on the more subtle points of composition. Without a doubt, pulling the foliage in was the right thing to do. Crossing foliage over the trunk minimally, I feel is a choice I can make. One that I may reconsider later possibly, but I feel no inconsistency here. Where are these rules / guidelines originating from? I must have missed that class. My aim: This is a high mountain, ancient tree. It has experienced many changes in it's long existence. It is experiancing a recovery at present. I feel happy with the progress at present. I feel happy with the evolving image at present. My school of thought is rooted in a combination of nature with a dose of artistic licence. 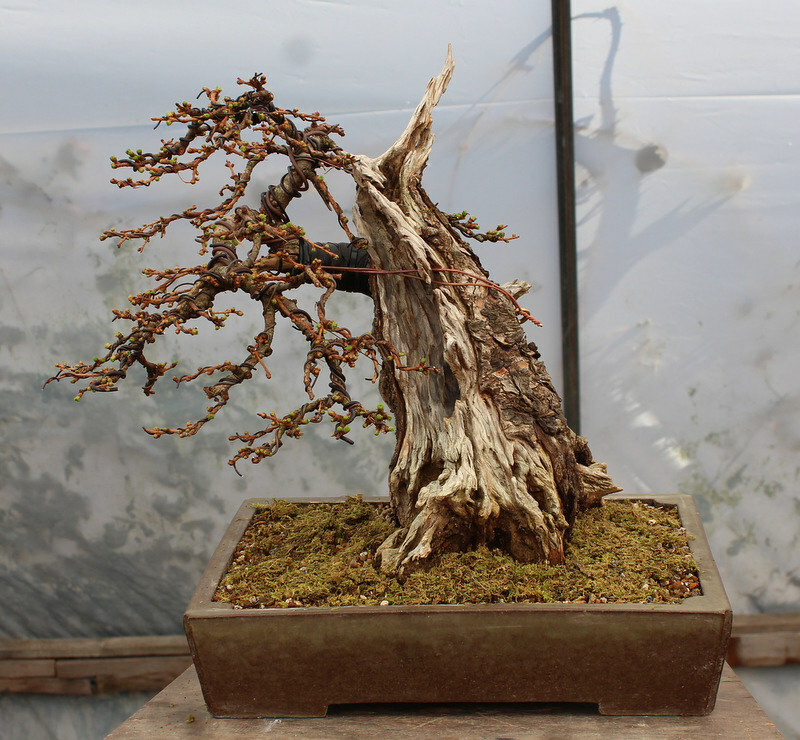 No rigid rules, just my personal feelings and bonsai experiance. My practices are based on feelings, rather than rules / guidelines. Knowing and understanding the rules and then challenging them is the way forwards for me and many others I work with. This clearly troubles some traditionalists. If this is an art form and not just gardening, we need to play and develop our practices, so all input is very welcome and much appreciated. Please do not take offence if I do not fully agree with all the input offered. amen... and good on ya for sticking up for what you believe. Jeremy wrote: Please do not take offence if I do not fully agree with all the input offered. Just to clarify (again), I am a nube. I am not a "traditionalist." I don't follow "the rules." I have never been to a class to learn them. 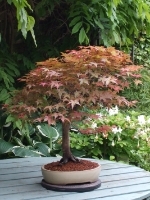 I was simply trying to reconcile my gut feeling about the composition, some of the bonsai design philosophies I've encountered, and the decisions you've made as the artist. I certainly wasn't challenging you or what you've done. It's orders of magnitude better than anything I have, so I feel insecure even inquiring. Thanks for taking the time. bottasegreta wrote: Just to clarify (again), I am a nube. I am not a "traditionalist." I don't follow "the rules." I have never been to a class to learn them. 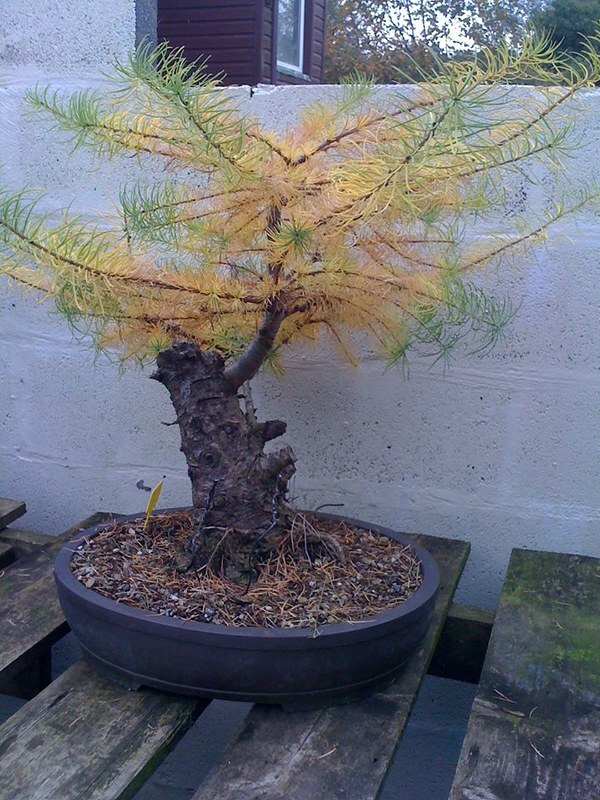 I was simply trying to reconcile my gut feeling about the composition, some of the bonsai design philosophies I've encountered, and the decisions you've made as the artist. I certainly wasn't challenging you or what you've done. It's orders of magnitude better than anything I have, so I feel insecure even inquiring. Thanks for taking the time. It's good to talk and share. I post here to garner others views and thoughts. Over the years I have made good use of such comments. So thank you for your input, it is truley much appreciated. 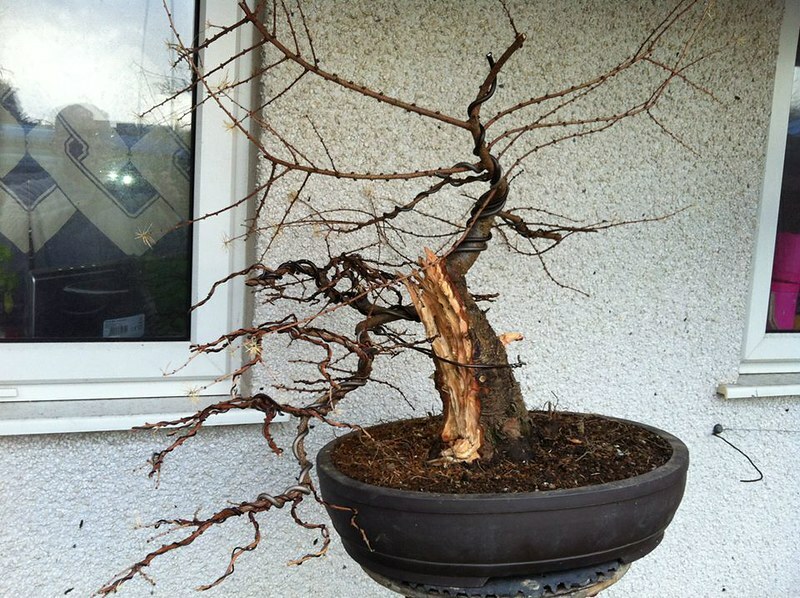 The journey we all take with our bonsai have many sidings and many deadend. Playing with your trees and listening to others allows us to find a path that suits us and our trees. Being challenged will make us think and that's a good thing. Steal the knowledge and make it your own. That's well within the Japanese tradition. Hi jerry,I hope you don't mind my input and a little info about the tree,good to see the larch is moving along something I always intended for it,when I first obtained it from Julian at dragon bonsai's annual boot sale event right away I thought it had great potential for ingoing development, I believed that the upper and lower branch's had no part to play in the styling as they were far to long, to thick,and very immature and completely out of scale so I decided to remove them both bringing the remaining foliage pad into proportion with the trunk so creating a smaller but more powerful image,I always knew that the branch structure had room for improvement as time went on so satisfied with what I had done I concentrated on carving and refining the dead wood trunk which I even considered splitting and wedging apart moving the foliage pad down and away?just a thought jerry ,just a thought, you know me,great to that Kevin and Pavel have had some input in to the refinement, its looking good mate please keep posting bob.